GRAINCORP Limited has sold its Australian Bulk Liquid Terminals (ABLT) business to ANZ Terminals for around $350 million, but plans to continue using the assets under a long-term storage agreeement with the new owners. GrainCorp acquired Australian ABLT in 2012 throught its purchase of Gardner Smith. ABLT operates eight liquid terminal sites across Australia, with a combined storage capacity of approximately 211,000 cubic metres. The sites specialise in the storage and handling of bulk liquid fats, oils, fuels and chemicals for a range of customers, including GrainCorp Oils. As part of the transaction, GrainCorp Oils will enter into a long-term storage agreement with ANZ Terminals. 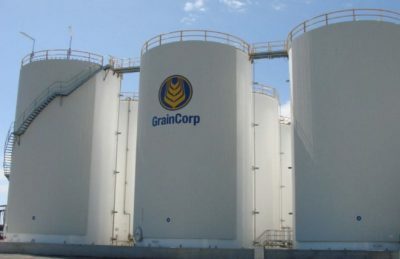 “Since we acquired the assets in 2012, the Australian Bulk Liquid Terminals business mix has evolved substantially and is increasingly serving other sectors, in addition to the edible oils commodities that are more closely aligned with GrainCorp’s core business,” GrainCorp managing director and CEO Mark Palmquist said. “ANZ Terminals is an established and respected bulk liquid terminals operator. We will work with ANZ Terminals to ensure a smooth transition for our customers and our people and through the long-term storage agreement we will have the access required for our trading and liquid feeds businesses,” GrainCorp Oils group general manager Sam Tainsh said. The transaction is subject to a number of conditions, including regulatory approvals from the Foreign Investment Review Board and Australian Competition and Consumer Commission. GrainCorp has retained ownership of its New Zealand bulk liquid terminals, which it said were better integrated into its supply chain. However, GrainCorp has not ruled out sale of these New Zealand assets at a later date as part of the company’s ongoing Portfolio Review which put ABLT on the market. ABLT’s sites are located at: Coode Island and North Laverton in Melbourne; Devonport in Tasmania; Largs Bay in Adelaide; North Fremantle near Perth; Hamilton and Pinkenba in Brisbane; and Port Kembla south of Sydney. The terminals have been part of the supply chain for GrainCorp’s Oils division, which can produce around 120,000 tonnes of canola oil for domestic and export customers, and roughly 180,000t of meal for the stockfeed market at its Pinjarra plant in Western Australia, and at Numurkah in Victoria.